Saturday night at UFC 219, there will be an important fight for the strawweight division, as former champion Carla “Cookie Monster” Esparza faces the streaking Team Alpha Male product Cynthia “The Calvary” Calvillo. The undefeated Calvillo has won three fights in a row, and she hopes to add a fourth while potentially stamping her ticket to a title fight with a win over Esparza. 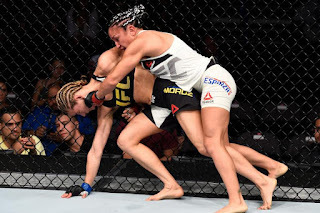 Esparza, the subject of this article, hopes to build on her unanimous decision win over fellow contender Maryna Moroz and put together a two fight win streak for the first time in more than three years. Today I take a look at what “Cookie Monster” has to do -- and has to avoid doing -- to spring the upset and secure a win. Cynthia Calvillo enjoys fighting off the back foot and will circle or retreat with the purpose of frustrating an opponent and forcing her to overcommit to an attack, running into a counterstrike or reactive takedown as a result. Much like former UFC Lightweight Champion Benson Henderson, Calvillo is very effective backing up, but that is only when she is allowed to dictate the pace and the circumstances under which she is backing up. What I propose Esparza do is apply steady pressure, cutting the cage off on Calvillo by stepping with her and using angles to limit her ability to escape freely, which also results in her being forced to work from the pocket. There, Calvillo’s lack of defensive acumen (head movement, positioning, and footwork) will be exposed. The most important thing it does, however, is force Calvillo to work at a higher pace than she would like, which burns up her gas tank on two fronts: she will have to move more to get away from Esparza’s pressure, and she will have to throw more (when she doesn’t want to or have to) in order to slow Esparza’s forward motion and to create clean exits. Steady pressure will also take away Calvillo’s ability to get or attempt takedowns. 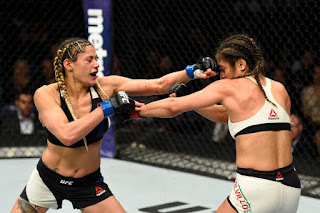 When Calvillo was forced to move often and under duress against Joanne Calderwood, we saw cracks in Calvillo’s vaunted cardio, as her movement and volume wasn’t maintained at the rate it had been in previous fights in the Octagon. And in her fight against Pearl Gonzalez, we saw Calvillo controlled and taken down repeatedly when forced to the cage. In my opinion, Esparza needs to walk her down. Calvillo is known for movement and for volume, meaning an opponent has to pursue her to land shots, and as mentioned earlier, often walks into shots or takedowns as a result. Esparza, being the smaller and less athletic fighter, won’t have the length or speed to initiate offense or close distance efficiently. So she is going to have to let Calvillo do her work for her. When she applies pressure, counter it with strikes, takedowns, or movement -- Esparza needs to consistently and aggressively counter Calvillo at every turn. A similar approach was used when Rafael Dos Anjos and Benson Henderson fought, as Henderson, much like Calvillo, would fire off strikes on the counter to back Dos Anjos off, create escape lanes, and do damage. Dos Anjos, for his part, would fire right back, reasserting the pressure and cutting off escape routes, forcing Henderson to exchange. Esparza would be smart to follow suit, as this would allow her to land due to the openings provided by Calvillo, instead of having to find or create them. This approach would also limit the volume and effective movement of Calvillo, as consistent and aggressive counters would break her rhythm and do damage. Feints and head movement would be valuable tools as well, useful for baiting Calvillo into throwing strikes, which Esparza could counter, not just with one or two shots, but early and often. She has shown the ability to do this against top end athletes and fighters, such as Moroz, Randa Markos, and Rose Namajunas. Due to Cynthia Calvillo’s movement, length, volume, and athleticism, it can be hard to land clean shots, especially to the head. Although she isn’t particularly nuanced in her offense or defense, she is effective at what she does. To limit her movement and volume, as well as take away the effectiveness of her athleticism, you have to punch holes in her gas tank; the best way to do that is to lead and counter to the body. The second reason for Esparza to attack the body is that it will allow her to find her rhythm and build her confidence, which will enable her to begin to land to the head as well, which will eventually shake Calvillo’s confidence and rhythm. Also, when I say “attack the body,” I include Esparza attacking the legs. Esparza’s stance and style creates multiple opportunities to score to the legs and body, which will score points and slow Calvillo’s movement while hindering her ability to establish her offense. This was done with some degree of success by Calderwood and Gonzalez. Calvillo’s ability to fight off the cage via intelligent blocks, parries, and counters has improved, but it’s not bulletproof; neither is her takedown defense. For her to be effective striking, she needs space, range and the ability to choose when to engage; if Esparza can force Calvillo to the cage, she can control her, force her to expend energy in grappling exchanges, land strikes effectively, take her down consistently, and impede her ability to create scrambles. Consequently, Calvillo will be unable to to gain superior positioning or find submission opportunities in transition or from her back. Esparza can work for takedowns in the open cage, but I believe that takedowns close to or against the cage will be easier and safer. Pearl Gonzalez and Amanda Bobby Cooper were both able to take Calvillo down, but Gonzalez had a bit more success due to being able to force her against the cage and take her down there. 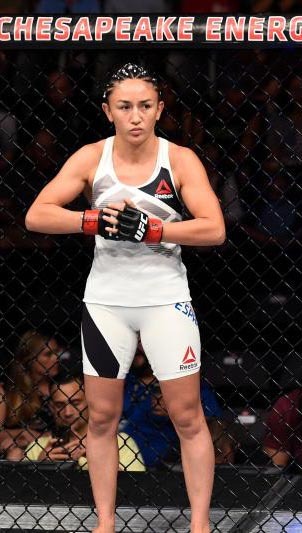 Takedowns off of shots and clinches is a must for Esparza; if she concedes that range, the fight is as good as lost, and the attempts will open up striking opportunities, taking some of the spring out of Calvillo’s step. An educated jab will set up all of Esparza’s offense. It will also increase her ability to safely and effectively apply pressure, mostly through legitimate jabs or feints that will let her find Calvillo’s timing as well as gauge and close distance. It will also allow her to maintain some control over the pace and place of the fight. This is because of the dual use of the jab (i.e. offense and defense) -- a good jab allows you to consistently disrupt, if not find holes in, an opponent’s defense while providing a line of defense for its user. Calvillo is sublime in her ability to create scrambles to win or improve positions, and even more so in her ability to transition from position to position or find submissions in transition. Esparza, on the other hand, needs to assert control and land strikes. If control is lost, or she is put into a neutral position, it would be in her best interest to escape and reset. As shown in her fight with Markos, Esparza can be outworked and out-positioned when she involves herself in extended grappling exchanges, and Calvillo has shown the ability to do that in all three of her UFC fights. Esparza must be vigilant if taken down; she must escape and get back to her feet. Chasing Calvillo will have you walking into counters and reactive takedowns, as well as being thoroughly outworked on top of being completely exhausted trying to catch up. When calvillo is allowed to control the pace due to her opponent’s inability to cut the cage or unwillingness to stay on her, she is virtually unstoppable. Pearl Gonzalez got thoroughly outworked and finished doing this, and the same happened to Joanne Calderwood in key spots of her fight with Calvillo as well. This also includes lunging in for strikes or takedowns, as either will result in Esparza being outstruck or taken down and submitted. If she is going to move forward, it’s got to be well set up and measured. Shots cannot be taken out of desperation or forced when facing a fighter with Calvillo’s submission, scrambling, and transitional skills; that is literally the worst thing you can do,. Amanda Bobby Cooper made that mistake and was finished within moments of said takedown. Pearl Gonzalez gassed and resorted to panic wrestling, which almost got her finished before she was taken down and finished later in the fight. This was partly as a result of wasting so much energy to get takedowns instead of countering and pressuring. And in the instances Esparza has panic wrestled in previous fights (Joanna Jedrzejczyk and Randa Markos), that has gotten her beaten up and bullied. Calvillo likes distance and open space; she operates when she is allowed both things. She is the bigger, faster, more mobile athlete, and if she is given free rein to move when and how she wants, she will out-position, outwork, out-athlete, and take Esparza down. Better strikers and better athletes than Carla Esparza haven’t been effective at range and in open space against Calvillo; working at an extended distance will allow her to safely lead or counter Esparza, and the open space allows her to determine when and how exchanges occur. If Esparza is stuck at range, or worse yet, getting pushed back, it’s a bad, bad sign in the fight. Esparza often likes to use extended distance to set up counters or reactive takedowns, but Calvillo’s ability and willingness to attack on all three levels will make that much more difficult. Saturday night at UFC 219, we will either see the emergence of a new star in Cynthia Calvillo, as she continues her ascent to superstardom and title contention, or we will see the reemergence of the previously undisputed queen of the strawweight division, Carla Esparza. Either way, the division will get another shot in the arm, and this fight will set the stage for a new contender for Rose Namajunas.